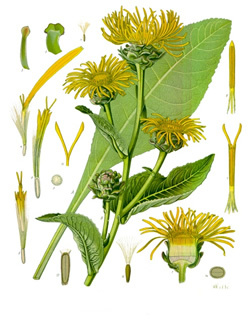 Elecampane is also a bitter tonic that tones the digestive system Pliny suggested that we should “Let no day pass without eating some of the roots to help digestion, and to expel melancholy”". Preparation Methods & Dosage :Decoctions or tinctures of the root. Elecampane is often used in cough syrups, and lozenges to treat coughs. Traditional Chinese Medicine In China, the native species of elecampane is called Hsuan-Fu-Hua. Chinese herbalists use elecampane root to treat pulmonary disorders, asthma and bronchitis. 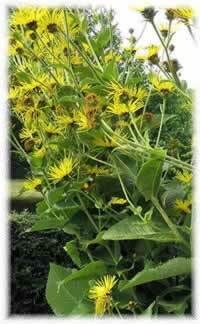 Elecampane Side Effects: Highly allergenic in animals and humans with sensitivity to plants in the sunflower family. Flowers:Large, yellow, solitary or a few, 2 to 4 in. across, on long, stout peduncles; the scaly green involucre nearly 1 in. high, holding disk florets surrounded by a fringe of long, very narrow, 3-toothed ray florets. Stem: Usually unbranched, 2 to 6 ft. high, hairy above. Leaves:Alternate, large, broadly oblong, pointed, saw-edged, rough above, woolly beneath; some with heart-shaped, clasping bases. Preferred Habitat:Roadsides, fields, fence-rows, damp pastures. Distribution:Nova Scotia to the Carolines, and westward to Minnesota and Missouri. The elecampane has not always led a vagabond existence. Once it had its passage paid across the Atlantic, because special virtue was attributed to its thick, mucilaginous roots as a horse medicine. For more than two thousand years it has been employed by home doctors in Europe and Asia; and at first Old World immigrants thought they could not live here without the plant on their farms. Once given a chance to naturalize itself, no composite is slow in seizing it. The vigorous elecampane, rearing its fringy, yellow disks above lichen-covered stone walls in New England, the Virginia rail fence, and the rank weedy growth along barbed-wire barriers farther west, now bids fair to cross the continent. Elecampane can be propagated by root cuttings taken from a mature plant in the fall, or can grown from seedlings, set out after the danger from frost has passed. The medicinal root is collected in the fall from 2nd year plants after 2 hard frosts. Elecampane has been used since the days of ancient Greece and Rome and was included in the U.S. Pharmacopeia as a remedy for bronchial congestion. The common name horse-heal may refer to this wild sunflowers traditional use in healing skin infections in horses and sheep. It grows in damp pastures and shady places throughout Europe, temperate Asia and North America. It was well cultivated in medieval herb and monastery gardens and was used in England before the Norman conquest. Immigrants to the New World brought the plant to North America with them. The Greeks named it Inula for Helen, wife of Meneluas, who was believed to have had an armful of the plant when Paris abducted her to Phrygia. Hoffmann, David (2010-12-15). Medical Herbalism: The Science and Practice of Herbal Medicine (p.70, 321). Healing Arts Press.